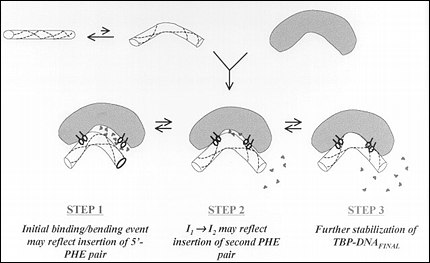 Using these various techniques, we have shown that the binding of DNA by TBP is a multi-step process, depicted below, in which DNA is strongly bent (by about 80o) in the very first detectable complex, one that we have proposed is the crucial intermediate involved in building the pre-initiation complex. We have used time-resolved fluorescence energy transfer (FRET) to show that the bending of the DNA is sequence dependent and correlates with the activity of the promoter in transcription. Using pulsed laser techniques, we have developed time-resolved acceptor FRET to measure distances in protein complexes in solution that exceed 100. At right is the ternary complex of TBP-DNA-TFIIA, with the distance between arrows at sites "A" and "B" corresponding to 115, a distance we have measured between dyes fluorescein (F) and xRhodamine (xR) attached to the ends of a 29-mer duplex DNA. 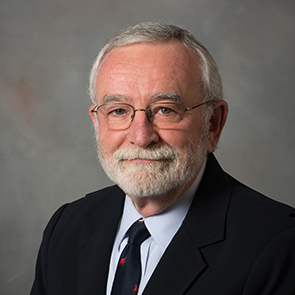 For more information, please visit the Parkhurst Research Group Homepage. 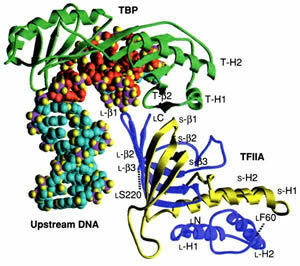 (2) TATA-Binding Protein Recognition and Bending of a Consensus Promoter Are Protein Species Dependent, Whittington, J. E., Delgadillo, R. F., Attebury, T., Parkhurst, L. K., Daugherty, M. A. and Parkhurst, L. J., Biochemistry (2008), published on the Web 06/14/2008. (3) Changes in DNA bending and flexing due to tethered cations detected by fluorescence resonance energy transfer Williams, Sarah L.; Parkhurst, Laura K.; Parkhurst, Lawrence J.. Department of Chemistry, University of Nebraska-Lincoln, Lincoln, NE, USA. Nucleic Acids Research (2006), 34(3), 1028-1035. (4) Native Human TATA-binding Protein Simultaneously Binds and Bends Promoter DNA without a Slow Isomerization Step or TFIIB Requirement K. M. Masters, K. M. Parkhurst, M. A. Daugherty, L. J. Parkhurst, Journal of Biological Chemistry 2003, 278, 31685-31690. (5) Comparison of TATA-binding protein recognition of a variant and consensus DNA promoters R. M. Powell, K. M. Parkhurst, L. J. Parkhurst, Journal of Biological Chemistry 2002, 277, 7776-7784. (6) Time-resolved fluorescence resonance energy transfer studies of DNA bending in double-stranded oligonucleotides and in DNA-protein complexes L. J. Parkhurst, K. M. Parkhurst, R. Powell, J. Wu, S. Williams, Biopolymers 2002, 67, 180-200. (7) DNA bends in TATA-binding protein.TATA complexes in solution are DNA sequence-dependent J. Wu, K. M. Parkhurst, R. M. Powell, M. Brenowitz, L. J. Parkhurst, Journal of Biological Chemistry 2001, 276, 14614-14622. (8) DNA sequence-dependent differences in TATA-binding protein-induced DNA bending in solution are highly sensitive to osmolytes J. Wu, K. M. Parkhurst, R. M. Powell, L. J. Parkhurst, Journal of Biological Chemistry 2001, 276, 14623-14627. (9) Marked stepwise differences within a common kinetic mechanism characterize TATA-binding protein interactions with two consensus promoters R. M. Powell, K. M. Parkhurst, M. Brenowitz, L. J. Parkhurst, Journal of Biological Chemistry 2001, 276, 29782-29791.